Sean Gibbs is a trumpet player and composer/arranger born in Edinburgh on 12th July, 1993. 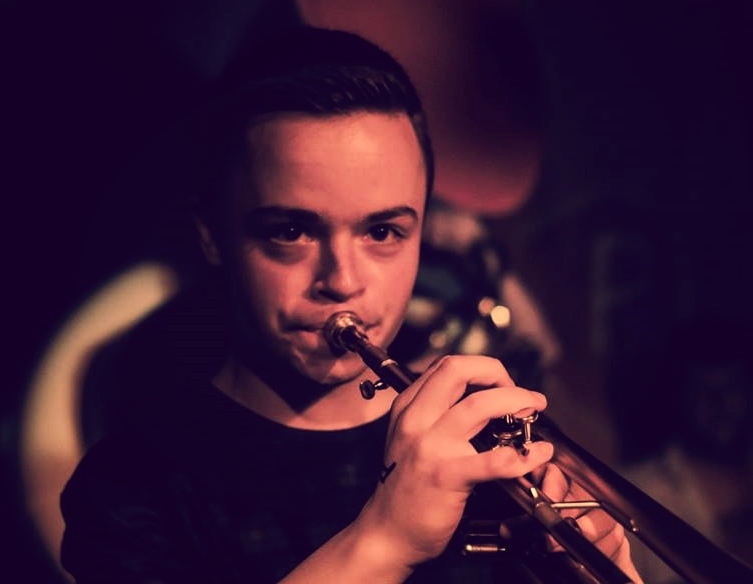 After growing up playing with ensembles such as The Tommy Smith Youth Jazz Orchestra and The National Youth Jazz Orchestra of Scotland, he enrolled on the BMus (hons) jazz course at Birmingham Conservatoire aged 18. He graduated from the course with first class honours in June 2015, winning the BMus Jazz prize for ‘overall success on the programme and contribution to the life of the department and fellow students’. During his time at the conservatoire, he studied with esteemed trumpet players Percy Pursglove and Richard Iles, alongside many international guest artists, including Mark Turner, Kenny Garrett, Joe Lovano, Dave Holland and John Taylor. Sean is now resident in London, and in demand as a performer across the UK and abroad. He leads his own band Fervour, who were awarded funding from Arts Council England to record their critically acclaimed debut album Taking Flight at the renowned Real World Studios and launch it with a UK tour in April 2018. Sean is also a member of the Scottish National Jazz Orchestra (with whom he has performed with guest soloists such as Kurt Elling, Joe Locke, Kenny Washington, Martin Taylor, Mike Mainieri, Brian Kellock, Laura Jurd and Eddi Reader), rock induced brass band Young Pilgrims, the Calum Gourlay Big Band, the Mike Fletcher Jazz Orchestra, the Martin Kershaw Octet and the Stella Roberts Sextet. As a freelance musician, Sean has performed with Jim Rattigan’s Pavillon, Eliza Carthy’s Wayward Band and Chris Dean’s Syd Lawrence Orchestra to name but a few. Sean is also a prolific composer/arranger, having written many works for big band, including commissions for the Scottish National Jazz Orchestra and Greater Manchester Jazz Orchestra. His critically acclaimed debut big band album Burns, featuring original compositions inspired by the poetry of Robert Burns, was recorded by the Birmingham Jazz Orchestra (which Sean founded whilst living in Birmingham) and released in the summer of 2015. Material from this album has since been recorded by the Tommy Smith Youth Jazz Orchestra, and performed as far afield as the USA, by the University of Miami’s Frost Studio Jazz Band.